Johnny Tucker: The idea is that we look back at the Rover chair as this starting point where key things happened, certain roads were taken, but I know Ron well enough to know we're not going to talk about the Rover chair all night. I think that it might just be a springboard to talk about other things. But Ron, if we could start with the Rover chair, or in fact slightly before that, at this very august architecture school we are in now. Is it true you turned up for your interview here with no portfolio? Ron Arad: I dug in the archive and found a little film, which starts with me talking about my time at the AA; in a way everything I know about architecture comes from this room. I didn't plan to study architecture and I didn't prepare a portfolio. But I found myself in London for all sorts of reasons and I knew someone who knew someone, so I joined the queue for interviews. I walked in and they said 'Can we look at your portfolio?' I said, 'I don't have a portfolio.' I had my 6B pencil. 'Why do you want to be an architect?' 'I don't want to be an architect, my mother wants me to be an architect.' She was a painter and every time I did a nice drawing she said, 'You're going to be a great architect,' thinking wrongly that it's safer than being a piss artist. How wrong she was. 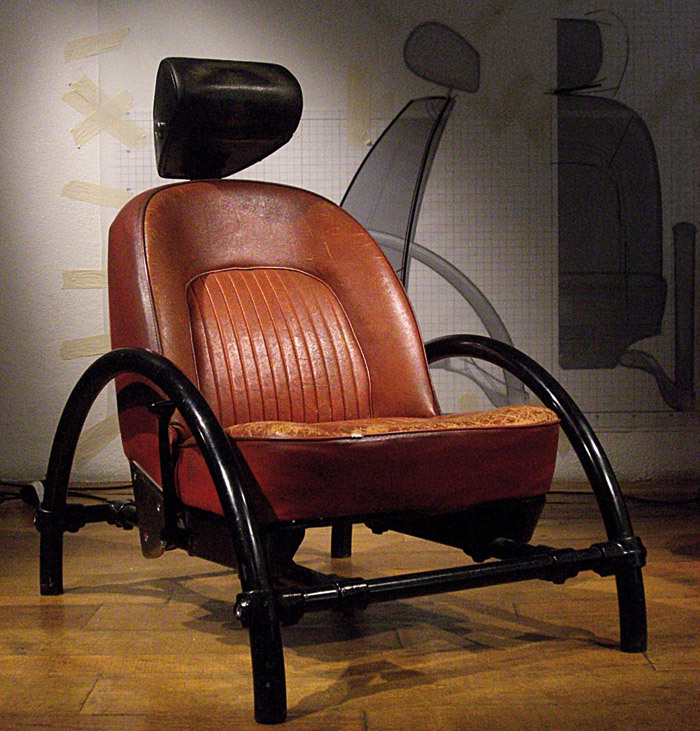 An early Rover chair version with a headrest. I went to the Royal College of Art, I went to the Slade and St Martins, but the AA looked more like an art school to me because it was wilder. It was a very pluralist place: there were Trotskyists, Peter Cook and the decadents, and Alvin Boyarsky was the chairman -- we could never tell if he was totally indifferent or a real pluralist. Everything was conceptual, nothing was real, no one intended to be anything anyway. I had an idea for a long time to choose a chair from a car to turn into a domestic piece of furniture and I went to a scrapyard. I carefully chose the Rover because it was symmetrical, it had four points to connect to the frame and an amazing mechanism. It was the first piece of furniture I ever did. I didn't know I was going to go into this world of furniture design. 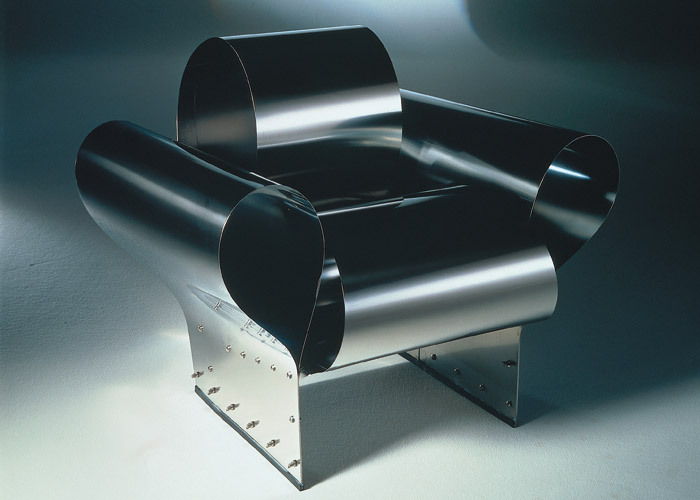 Years later, when I showed my very own Rover chair at the Pompidou Centre, I remember setting up the exhibition and being shouted at for touching it without white gloves. 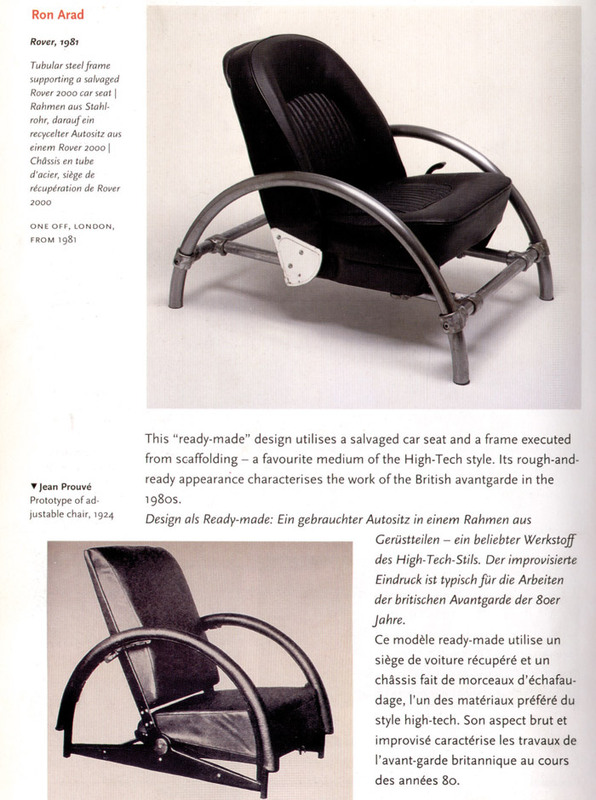 This is where Blueprint comes in: one day I read that Rolf Fehlbaum from Vitra saw me as one of Britain's most interesting new designers - and I promise you I did not know that I was a designer at that time - I just did something. Later Vitra called me in to design for them. JT: Where did the idea to go to a scrapyard come from? RA: It came from ready-mades - Marcel Duchamp, Picasso's Toro bicycle seat and handle bar - it came from doing something that I could do. It wasn't part of an ecological campaign, although shortly after the Rover chair got some fame, Friends of the Earth put it on the cover of its magazine. I learned to weld at Shorts Gardens [site of his One Off shop in Covent Garden]. I used to come everyday to weld and make furniture. In the windows there was calligraphy and cartoons. 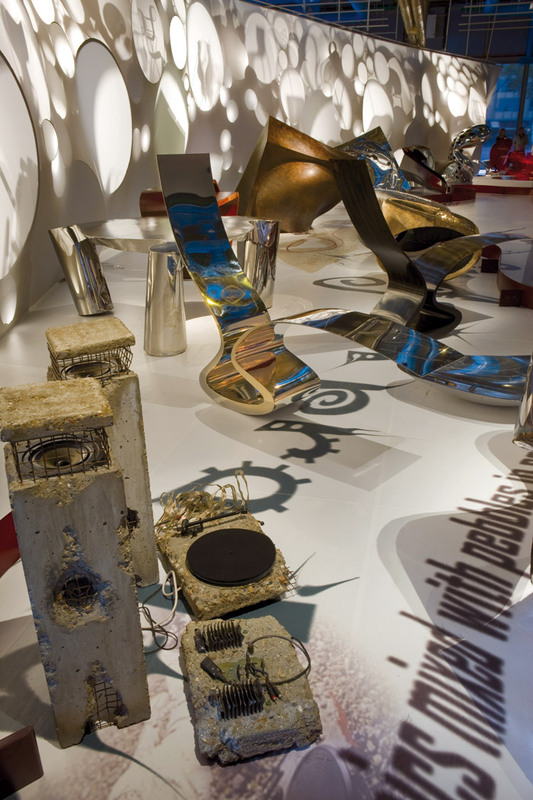 In 1986, the Pompidou Centre celebrated its 10th anniversary and did an exhibition, Nouvel Tendance. I was called 'the ruinist' by the French, and I thought I am creating beauty and exposing beauty where it's normally hidden. I thought I'm a jeweller or something. They decided to invite me, I was the youngest of all the participants. I did things not out of ideology, I did what I could do; there was nothing ruinist about it. JT: During that period, you made a lot of Rover chairs. How did you sell the early ones? RA: I was at Shorts Garden one Christmas Day and there was a funny guy knocking on the door. I said, 'We're closed.' He said, 'But I want to buy these chairs!' He came in and bought six. He paid there and then, £99 each, and gave me an address in Paris to deliver them to. After the holiday, Caroline [Thorman, business partner] looked at the cheques and said, 'Ah, Jean Paul Gaultier.' I said, 'Who's Jean Paul Gaultier? In 1981, I didn't even know who Jean Paul Gaultier was. Later we discovered we shared the same birthday. I did his shop on South Molton Street, in London, and shortly after that - and definitely not because of that, because it was a private affair - the chair became a best-selling piece; people just wanted to buy the Rover chair. Richard Rogers bought one as well. I employed two people with a van to go up and down all the scrapyards in the country to get any Rover seats they could, in any condition, and a motor trimmer in Kentish Town. [They] stopped taking on any other work and concentrated on repairing the Rover chairs for me. At some point, we declared we were making the last 100 and some crazy guy from Sweden bought them. What I really didn't get about this guy was that he was a fan of mine and of Guns N' Roses. He saw a connection, I didn't! JT: And what did he do with them? He sold them on? RA: Yeah. They keep appearing. We get emails once a week with a picture of someone wanting to authenticate a fake Rover chair. One look at it and we can tell you whether it's real or not. RA: It was perfection, if something's not perfect you can really tell - it's easy, they shout out. The ones on Top Gear are something else - don't get me started on that! On the first series, they hired the Rover chairs from a company and then Jeremy Clarkson decided why hire? We can make it ourselves! JT: So you declared the last 100. Had you already made quite a few up to that point? RA: Yes we had, but I didn't want to have an expensive education at the Architectural Association and then be a second-hand car dealer. I did my bit and wanted to move on. JT: What other things were you doing around this period? 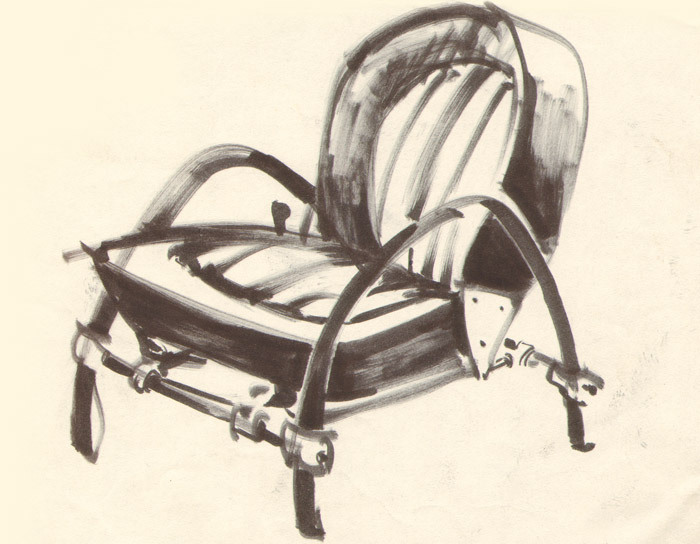 RA: The Rover chair dragged me into the world of furniture design. 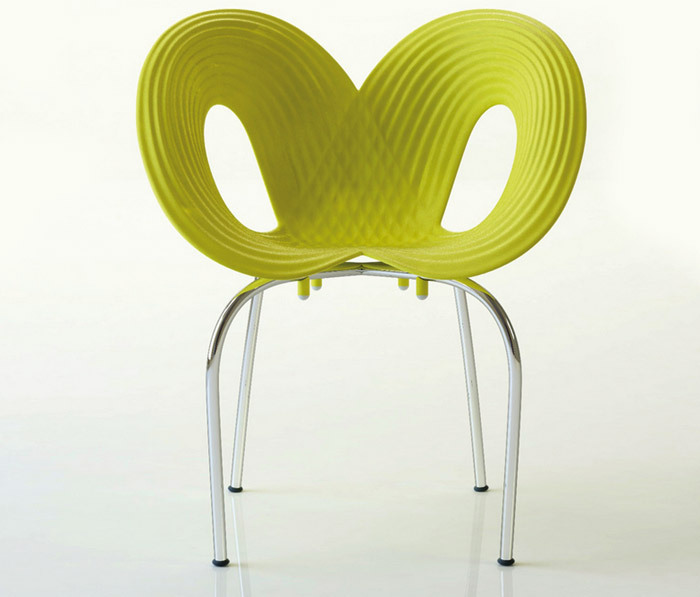 I did the Well Tempered chair for Vitra. Rolf Fehlbaum, the owner of Vitra, did the Vitra editions and invited people he was interested in to do a piece of furniture without any commercial constraints -- it didn't need to be a best-selling piece. He flew me to visit the Vitra factory and it was mind-blowing to see 1,500 people with the latest technology and manufacturing, all making furniture. He said to me: 'Use whatever technology you want here. 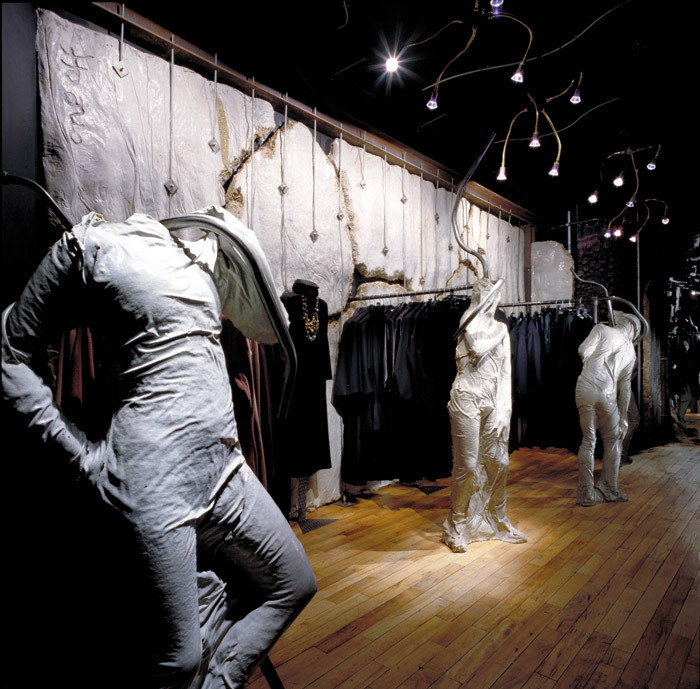 Design something and we'll make it.' I used tempered steel, which is like sprung steel because it has no memory, you bend it and it comes back and can't remember it was ever bent. The curves you get are not designed by me with French curves, the curves are literal, and I wanted to do a chair that is almost the easiest portrait of a club chair. I knew it was going to be sort of comfortable because there is no big mystery in making a chair comfortable. I made a video of people trying it for the first time and, like someone putting words in their mouth, they all said 'actually it's very comfortable'. This was against their expectation. And that's a really good thing to do, break people's expectations. It's even better if you break them in a positive way. 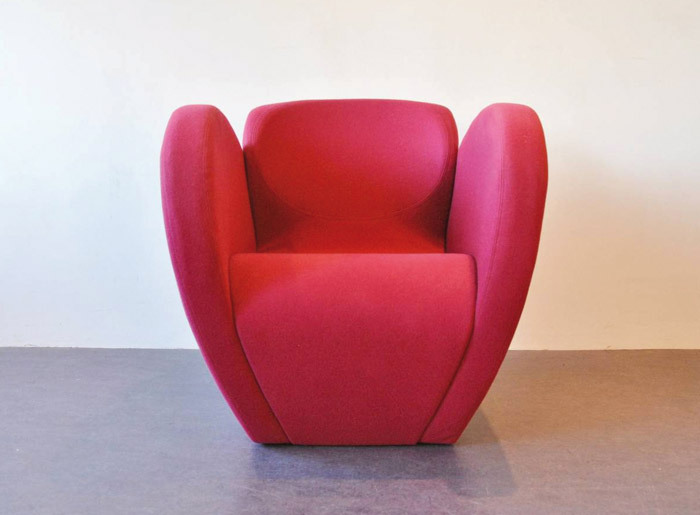 I think Peter Cook wrote about the piece, saying this chair is like a dog you are scared of, but after you poke it you realise how friendly it is. In a way I failed in my exercise with Vitra because I was offered the use of the factory and I did something that I could do myself, with scissors and a staple gun. I didn't need Vitra to do it, in fact quite the contrary - they couldn't find tempered steel so I ended up sourcing it for them. It was a complete failure but I'm very happy about it. I used to take a piece of metal and bend it and bash it until it admitted to be comfortable. All these pieces that were later called the volume pieces are a result of a five-minute sketch on paper. The first were crude and sort of undisciplined. You can rationalise it, by saying not everything should be perfect and why can't a piece of furniture have the quality of a sketch. It was the nearest to action-painting designing furniture. I got better and better. There's no problem about changing the lyrics now and saying it's about perfection, it doesn't matter what you do. The same thing happened to these as the Rover chairs. At the height of their success I had to stop making them. It was good for a time, but I was in fear of becoming a craftsman, I didn't want to be like a glassblower - it doesn't suit me. At this point I moved the whole operation to Cantu near Como in Italy, so I could do other stuff. If you are a serious collector, you would know the difference between a piece that was done in Chalk Farm and a piece done in Italy. The one done in Italy was much better made and the ones was done in Chalk Farm are a lot more expensive! For some reason I dragged the architecture to the same place. That's when we designed the public spaces of the Tel Aviv opera house. We won a competition. Actually, the people who worked on the metal work for the opera house are the ones that started at Ron Arad Studio. I remember when I was shortlisted for the opera house I had a visit from the people in charge. I asked lots of my friends from the AA to bring their drawing boards to my studio. I said, 'Do whatever you want, pretend to work.' I just didn't want the opera house people to come and see a welder, I wanted them to see drawing boards, and it worked. JT: Do you want to go on to a couple of new projects you have coming up? 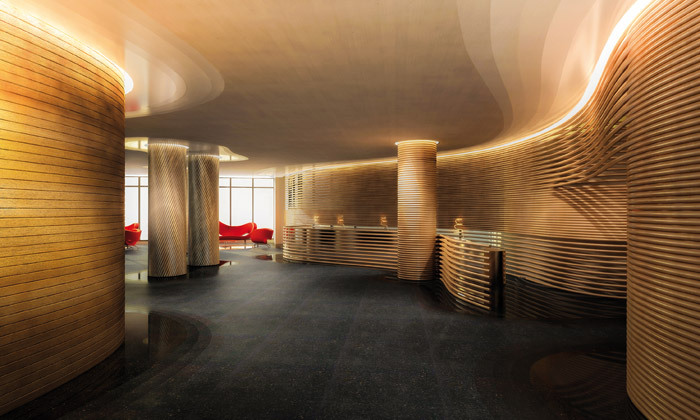 RA: We are now at the last stages of redoing the Watergate Hotel in Washington, the one where the Nixon scandal took place. Although we try to avoid doing interiors as such, this was something that was very difficult to say 'no' to, because of its legacy. We're doing something that has a big presence, but doesn't fight the building and accepts the general diagrammatic flow of the curves, without being a pastiche of the building. We're also designing some towers in Tel Aviv. We started with doodles and then some renders, testing the client to see if they got scared or if they would continue. They did continue, and now it's on site. It has a very small footprint, leaving the land to be enjoyed as a park. This is another funny thing with authorities: normally when you do a project, you are told by the city you can't do it so high. Here, because the next city had a taller building, they asked us 'Can you make it taller?' We didn't want to do another phallic building, so we used the metaphor for an iceberg rather than a cucumber. JT: Do you want to talk about the Onion House as well? RA: The Onion House is a prefabricated house as a product. We wanted to call it Apple but we googled it and it was taken, so we called it Onion! It's slightly modular in its concept, it has a concrete core and rings, you can put in walls or leave it empty, and because it's on a stand it can be on water. It is a very ambitious package, and it's made in Italy. Every project invites a different kind of discussion, and I love all of them; I love the big scale and I love the very small scale. You don't have to commit yourself to one thing. That's why it's a team effort, different people in the studio with different ideas. It's not just one man. JT: How do you see yourself now? Do you see yourself as designer, an architect or an artist? RA: All of the above. If you ask an architect, I'm not an architect, if you ask an artist, I'm an architect.